At a recent candidate forum — one of roughly a dozen attended by the six Republican candidates vying to replace outgoing state Sen. Troy Fraser, R-Horseshoe Bay, in Senate District 24 —Susan King said she was pulled aside by a constituent who wanted to offer a compliment. It was a telling exchange in a crowded race where the candidates have made so many joint appearances in this sprawling district that they can practically recite each other’s stump speeches from memory. 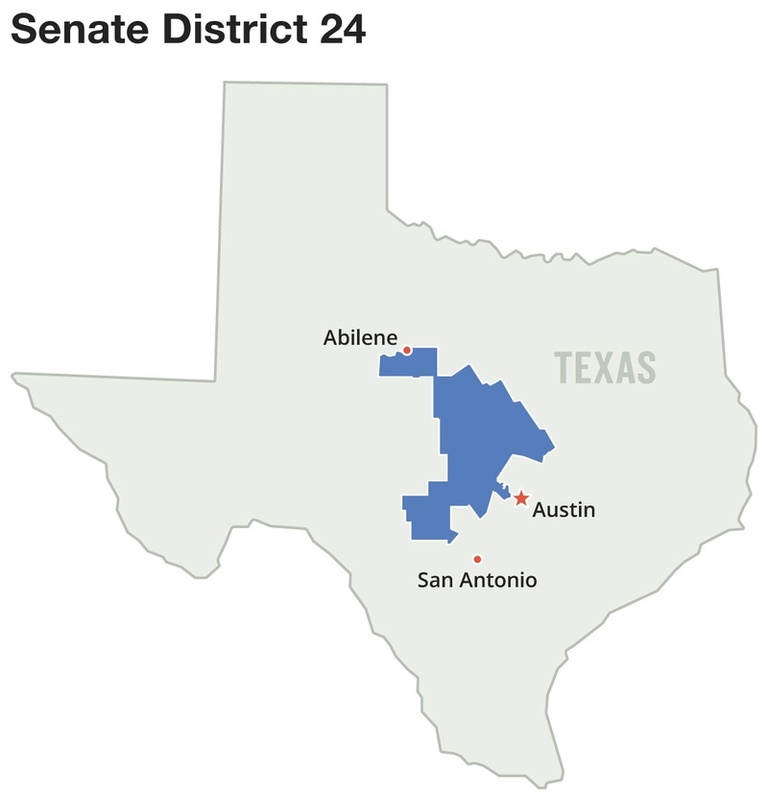 Now, the question is whether they can find a way for voters across a district that stretches 20,000 or so square miles, from Abilene to the northwest suburbs of Austin, to tell the difference between them. The six Republicans, of whom two are likely to advance to a May runoff, are all touting similar hardline opposition to lightning rod issues like illegal immigration and the Affordable Care Act. They’ve all voiced support for expanded gun rights. And they all claim to have the support of conservative leaders. That means personality politics and regional differences among constituents are likely to affect which two candidates will advance, said Brandon Rottinghaus, a political science professor at the University of Houston. Those different interests were apparent this week at a candidate forum hosted by the Central Texas Water Coalition in the Lake Travis community of Lakeway, where candidates were asked about balancing the water needs of lakefront communities with those of rice farmers downstream. Five of the six candidates voiced support for raising the price of water from the Colorado River for agricultural use so that farmers would be charged the same price as cities and commercial users. Each time, the audience applauded. But King, who touts a 2014 endorsement from the Texas Farm Bureau, said she “couldn’t speak to” what a fair price was for agricultural users, adding that price hikes on farmers’ water would lead to higher prices for consumers at the grocery store. “I don’t think we can solve that discussion tonight,” she told the forum. King has framed the major differences in the race as geographic. She lives in the more rural northwest corner of the district and has pointed out that she is the lone candidate from the district’s northern, more agricultural half. Her candidacy has been endorsed by rural allies like outgoing fellow state Rep. Jim Keffer, R-Eastland, a lieutenant of House Speaker Joe Straus. Her opponents, meanwhile, are framing the race as one pitting “establishment” candidates against outsiders. Travis County resident and eye surgeon Dawn Buckingham, who at last tally led the field in fundraising, launched an aggressive, early media buy, airing television ads that called her an “outsider” candidate who would target “career politicians in Austin.” She has also been an active member in the Texas Medical Association, a physician lobby group. At the water forum, Buckingham said she supported raising the price of water for agricultural consumers in order to create “added value to their land” — the idea being that higher prices would motivate farmers to use less water and then sell their surplus to other consumers. Buckingham, who has been endorsed by former Gov. Rick Perry and current state Sen.Charles Schwertner, R-Georgetown, said her primary issue in the race was securing the Texas-Mexico border. She called for expanded deployment of the Texas National Guard and utilizing advanced technology to stop illegal border crossings. She also touted her experience on the Sunset Advisory Commission, which evaluates the efficiency of state agencies and can recommend that they be closed down, as evidence for her commitment to slashing public spending. “I am the conservative in this race … with the proven history of cutting government,” she said. 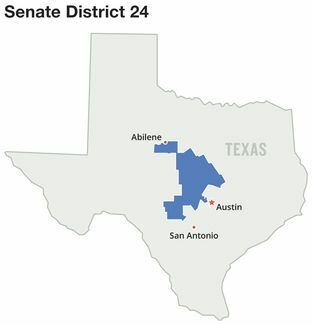 Competing for the title of most conservative was Brent Mayes, a retired radiologist from Fredericksburg who has been endorsed by prominent social conservatives like Steve Hotze of the Conservative Republicans of Texas and Cathie Adams of the Texas Eagle Forum. Mayes said he would challenge the authority of unelected quasi-governmental boards that regulate water use, such as the Lower Colorado River Authority. The race also features Jon Cobb, owner of Blanco Concrete, who said transportation, education and water were his top campaign priorities. “I’m a business person, and I’m a practical person, and I can build coalitions with people that are reasonable,” he told the Lakeway forum. Downton urged the audience at the candidate forum to “examine the backgrounds” of candidates who had donated to Democrats, a likely reference to Reed Williams of Burnet and Buckingham, both of whom have faced criticism in conservative media outlets for making political contributions to the campaigns of Democrats in past years. Williams said his history as a conservative member of the San Antonio City Council had given him valuable political experience and said groundwater pumping would be key for Texas to survive future droughts. The winner of the Republican primary will face Democratic candidate Virginia “Jennie Lou” Leeder in November. Disclosure: The Texas Medical Association is a corporate sponsor of the Texas Tribune. The University of Houston was a sponsor of the Texas Tribune in 2013. A complete list of Tribune donors and sponsors can be viewed here. Correction: A previous version of this article said Susan King had been endorsed by the Texas Farm Bureau. That endorsement was for her 2014 race for the Texas House, not for this year’s Senate race.